A recent call from my Mother got me thinking about the topic. She is 82, a child of the depression, frugal not cheap and has an interesting creative streak that she displays often. She called me to brag a little on her latest recycle/reuse/re-purpose discovery. A couple of years ago I made her a calendar featuring family photos for the various months. Fully opened it measured 11X17 inches, so each sheet is 8.5X11 inches – a standard US paper size. She needed more file folders to aid in organizing her papers and statements and hit upon the idea of using the out of date calendar. She was able to create 6 folders with the photo(s) of family on the outside of the folder ( so she could gaze on our lovely faces) and the meaningless dates on the inside. How clever…….I believe she noticed that when she finished the photos were upside down……I am sure that is fixed by now…. Greeting cards sent to Mom will find their way back in a re-purposed condition with the added bits of this and that she has lying about. Many of the bits and pieces she has lying about become awards that she hands out as outstanding achievement recognition for her 16 or so Tai Chi students…. complete with Chinese characters that she makes up – including some bogus definition & they all seem to believe her! She is a recycled Tai-Chi instructor from one of her previous lives…. She will re-gift and as far as I know it has not boomeranged on her – yet! Yard sales provide a treasure chest full of goodies for which her creative side will find a use for each and every item – eventually. So, Mom, I must come by some of it naturally and I do think Dad’s genes must be an influence….although he was not nearly as creative as you are…. he had lunch boxes, jars, cigar boxes and file cabinets filled with things that may be needed somewhere down the road…and yes I have a bit of his collection – brought back to Texas after he passed. Note to Kathy – my wife – I needed a hook latch for the new gate I just hung and I knew I had one in my collection….thanks to daughter Ashleigh, I found it in one of the bins that she had organized – result – no trip to the hardware store to buy something that I already had but couldn’t find! Let’s see if I can tie this back to my little backyard farm…..hmmmmmmm. Second try – just lost 400 words and a photo – the words should still be fresh in my head – operative word is “should” – I do have the photo – the computer is a little more reliable, most of the time. I know that I have mentioned my recycled fence screening my wife’s portion of the yard from my garden/backyard-farm in previous posts. The fence materials as well as most of the lumber used for the compost bins were from the recycling and remixing done by the Hurricane Ike winds. The eye of the hurricane took well over an hour to pass over our house and neighborhood. The fences that were leaning hard one way were violently whipped to the other direction as the back side hit and the 110 mph winds did a 180 degree turn. In hindsight I could have and should have made a concerted effort to salvage many more down fences…..I could probably still be building for my friend John – he needs a fence as his Golden retriever loves ripe and vine picked tomatoes, as well as many others. I even saved the pulled nails and carefully and patiently was able to straighten and reuse the nails! I have been the recipient of some wine display props no longer needed and heading toward the trash heap…..shelves, wheel barrow, signs, barrels and other do-dads. My garden potting bench was rescued from a garage clean out and until recently my garden hoses were also rescue hand me downs……some work needed like end pieces and duct tape for the minor leaks. My wife helps the community recycling effort through” Kingwood Yardsale”, an online posting site. She buys and sometimes sells through the site…..remember Hun, I am still looking for a small sink to add to my potting bench. 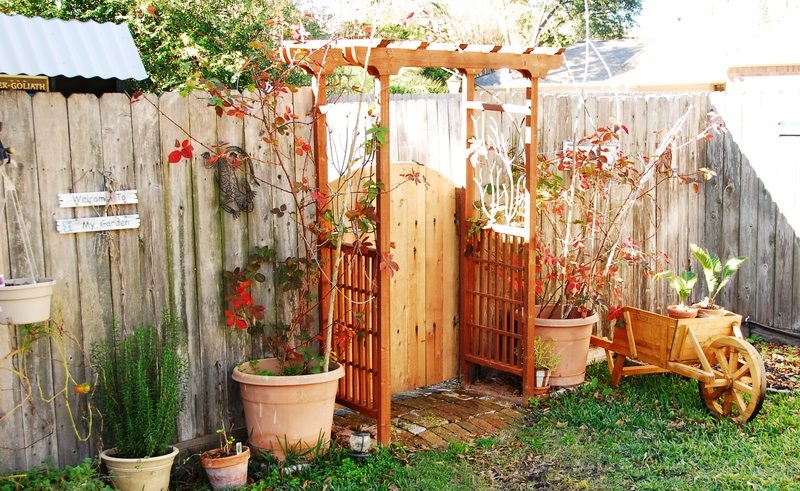 Recycled fence, pots, barrow, bricks - gate is a mix of old & new - arbor - not!. Both Hurricane Rita and Hurricane Ike downed literally thousands of trees in our area. From the downed oak trees I have turned out a handful of items on my wood lathe – bowls, boxes, pen & pencil sets, travel mugs and a duck call. This area of Texas is in the midst of a major drought and thousands of dead trees are being removed, most of which become mulch after grinding them up. I have noticed many of the dead trees are being sectioned and sent to some of the small lumber mills that dot the country side. The landfills can’t absorb the massive volumes being generated right now. 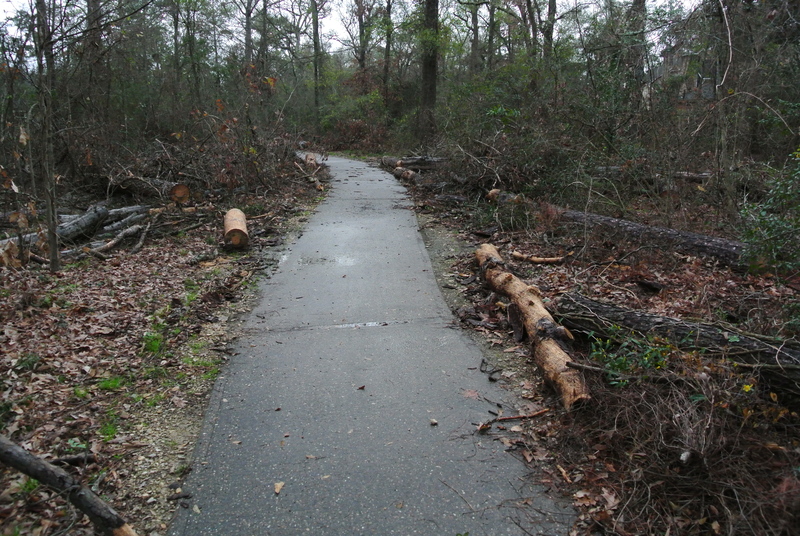 The photo below was taken a couple of days ago along one of our many “Greenbelt” paths…becoming more and more bare! I have plenty of pieces to work with but I still have my eye out for something special…a burl or a nice crotch – like from a tree!!!!! or anything that may lend itself to another purpose. The disappearing green of the green belt. Those 400 lost words – those words above are parts of what I could remember plus a few more…..I had written some words concerning allotments – a British passion – that were lost – those words will find their way into a future post….if I remember! Love you commitment to the earth! We lost our first home in Hurricane Ivan. With no flood insurance I began the hunt for all things to recycle for my garden. Everything is found or from Craigslist! More than 75% of the plants were brought from the old house as I like to call it! I’ve been in a couple of good-sized windstorms (including one that sent a section of the back fence through the bedroom window while I was on the other side of the room on the phone, busy reassuring my sister that the storm was no problem in our neck of the woods), but find it hard to imagine being in the middle of a hurricane for an hour. I’m glad you made it through, even if your property didn’t have an easy time of it! Your versions of reused and recycled things are a whole lot more attractively worked and sensible than many. It’s good to see a proper example set so that those who are put off by “icky” used things can see that it’s a matter of commitment rather than original excellence that determines the resultant worth of a refurbished object. Just an additional note on my reuse of materials…..I have a built in aesthetics coach…. and she has a pretty good eye – If left totally to my own I may be asked to leave the neighborhood. That is really attention-grabbing, You are a very skilled blogger. I have joined your rss feed and sit up for in quest of more of your wonderful post. Also, I’ve shared your site in my social networks!